Since opponents began blanketing the airwaves — two spots that contain the inaccurate statistics have aired more than 500 times in recent weeks in the Boston and Springfield areas — support for expanding the bottle law has dwindled to just 33 percent, while 60 percent said they would vote against it, a new Boston Globe poll shows. That finding is a near-reversal of a Globe poll in August that found 62 percent of likely voters supported expansion of the landmark environmental law. 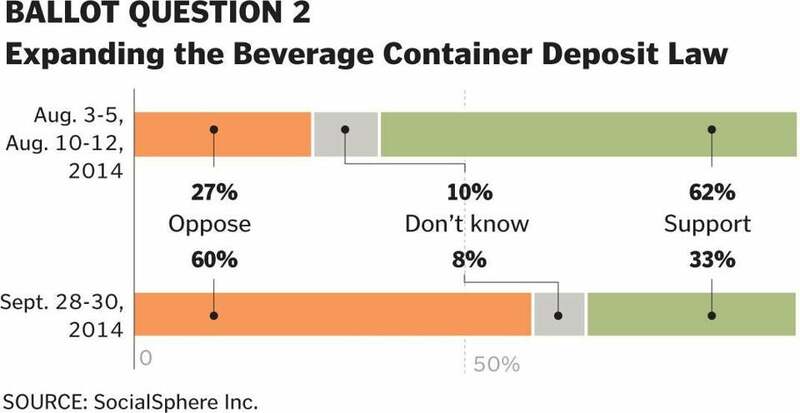 Then the ads opposing Question 2 began to run, fueled by nearly $8 million in contributions from the American Beverage Association and large supermarket chains. If it passes, the bottle law initiative will extend the state’s current nickel deposit to bottled water, sports drinks, and other noncarbonated beverages. Designed to encourage recycling and reduce litter, the 32-year-old law currently requires a nickel deposit on soda, beer, and malt beverage containers. “Whatever you think about the policy, the moves by the no side of Question 2 are masterful,” said John Della Volpe, chief executive of SocialSphere Inc. in Cambridge, which conducted the poll. Supporters of the ballot initiative, who have raised about $700,000 from environmental groups and have yet to air television spots, have called their opponents’ ads “false or misleading.” They have urged the office of Attorney General Martha Coakley to investigate, and have asked TV stations to stop airing the ads. The opponents’ ads say that 90 percent of state residents have curbside recycling, which they use to suggest that the bottle redemption law is no longer needed. The state Department of Environmental Protection, however, says only 47 percent of Massachusetts cities and towns offer curbside recycling, reaching 64 percent of the population. “We’ve been monitoring and tracking recycling in cities and towns, and we have the right numbers,” said David Cash, commissioner of the Department of Environmental Protection. Generally, curbside recycling takes most bottles. But if people want to redeem their nickel deposits, they have to return their bottles to a supermarket or a redemption center. Cash said his agency has determined that nondeposit bottles outnumber deposit bottles by three to one in the litter found in public parks, even though they make up only 40 percent of the market. He also noted that the bottle law, unlike curbside recycling, encourages recycling of bottles people take with them when they leave home. “Historically, the bottle bill has worked at pulling bottles that have deposits on them out of litter in public places,” he said. “We’re adding a citation to further substantiate our point,” said Nicole Giambusso, a spokeswoman for the No on Question 2 campaign. Supporters of expanding the law point out that the footnote still uses the statistic refuted by the Environmental Protection Department, which reports to the Executive Office of Energy and Environmental Affairs. The supporters say the 90 percent figure conflates curbside recycling — in which a municipality picks up bottles at people’s homes — with other recycling programs in the community. Domenitz raised other concerns about the ads. She noted that a narrator in one says “politicians get to keep” all the nickels that pile up if consumers don’t redeem their deposits. That money now goes to the state’s general fund, but if the question passes, it will be designated for environmental programs. “There appears to be no evidence to support claims that updating the Massachusetts [bottle law] will result in increased costs or reduced consumer choices,’’ the authors wrote in the report. Giambusso, the No on Question 2 spokeswoman, defended the ads, saying politicians could change the law to keep the money in the general fund. She added that consumer prices rarely drop — meaning that the deposit is likely to rise over time (although it has remained a nickel since it took effect in 1982) — and that supermarkets would incur additional expenses for the thousands of additional bottles that would ultimately be redeemed, costs she said they would pass on to consumers. The Yes on 2 campaign acknowledged that its complaints are unlikely to spark any official action for weeks, and probably not until after the election. Officials from Coakley’s office declined to comment on the merits of the complaint. “We’ve received the letter and are currently reviewing it,” said Christopher Loh, a spokesman for the attorney general’s office. Many of the TV stations that run the ads, which have been a lucrative source of income, did not return calls for comment.